When one thinks about it, there really is only ONE card that can curve into removing this minion: Fireball. And perhaps, that makes it good enough. SO far, most spell damage non-Malygos minions would always be killable curve-wise. 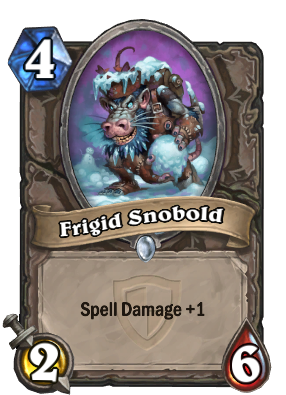 To get rid of Snobold, is to use 2 cards. Plus, in a deck where you can get some real Spell Damage value, it might be really good. I was listening to the Grand Tournament sounds and heard this: "You n-n-not take s-s-snowball!" luckily, Neither Kodo or Cabal are played that much. Lath it, it's phaphing aphazing. Anti-aggro in the extreme. Costs little enough that it can be comboed with cheaper AOE late game to clear, and probably even survives it if you use something like Hellfire; plus, it can trade for 2 3/2s on its own. Just having such a high health spell damage guy is nice, too. His stats are half a malygos, and his effect is part of it. It's a pretty good card. No, but it might snowball in control.